Five years ago, Google CEO Eric Schmidt proclaimed that laptops would become disposable. We’re nearly there. Starting today, you can buy a new Chromebook for just $150—the cheapest price ever. And this spring, there’s a $250 Chromebook coming that looks pretty incredible. Let’s put things into perspective. Chromebooks aren’t the only awesome cheap laptops on the block anymore. The HP Stream 11, a surprisingly capable $200 Windows machine, made sure of that. But now Google is going where Windows may not be able to follow: bargain-basement processors. The key to the latest batch of Google machines is the Rockchip RK3288, a piece of silicon from a company whose chips typically only feature in the cheapest smartphones and tablets—but now has a processor potent enough to power Chrome OS notebooks on the cheap. In the case of the new Hisense Chromebook (pics above) and Haier Chromebook 11—available today from Walmart and Amazon respectively—that $150 still means fairly cheap, relatively flimsy laptops with pretty terrible screens. But they’re ones that boot in a flash from 16GB of solid state storage, have decent keyboards and trackpads for getting a little work done, and come with the promise of all-day battery life. They’re honestly not bad! And that cost savings on the processor could translate to something pretty special if you’re willing to spend a little bit more on a machine. 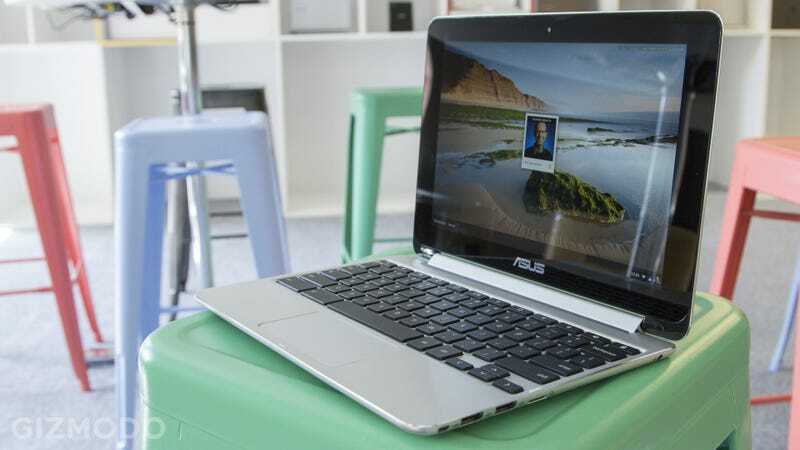 Like, for instance, the $250 Asus Chromebook Flip. Now this is what I’m talking about: a sleek 10-inch backflipping aluminum notebook. Not a flimsy piece of crap at all. A laptop that not only technically doubles as a tablet, but actually feels thin enough and light enough to hold in one hand. A Chromebook with a decent-feeling keyboard, trackpad, and touchscreen, for just $250. And, as you might have noticed, a Chromebook with a revamped version of Chrome OS that makes more sense for touchscreens. Starting with the next big build, Chrome OS will flip into a full-screen touch mode when you tilt your device, just like you see above. There’s a pretty decent virtual keyboard now, with auto-prediction and handwriting support. The Search button on the keyboard will now take you to a single launcher with search, apps, and yes, Google Now cards. And—this is pretty cool—Smart Lock can automatically unlock your Chromebook when your Android phone is nearby. If the Chromebook detects an Android phone logged into your Google account—just by being within Bluetooth range of 25 or so feet—you can simply tap your photo to log into the Chromebook instead of typing a password. It’ll even carry over your Google account’s two-factor authentication. Oh, and Google’s opening up the floodgates for Android app developers to port their apps to Chrome starting today. The famous VLC media player is already on the way. It’s hard to say just how compelling these Rockchip machines will be without a lengthy test. We’ve definitely seen that even the relatively lightweight Chrome OS can benefit from some extra headroom. As of last week, all of the top Chromebooks we recommend had relatively powerful processors and 4GB of RAM. Either way, all the new software updates will come to every Chromebook. Look for ‘em soon. Or, if you’re not interested in a laptop, check out the new Chromebit: a sub-$100 dongle that can turn any HDMI-equipped TV, projector, or display into a Chrome OS computer.